I am just about to embark on my first N gauge layout. Being ex RAF the layout would not be complete without a small non flying RAF Unit. Fortunately I was able to purchase on e bay at considerable cost a mint condition Metcalfe RAF WWII kit which they produced for Corgi some years ago. However, am having problems locating N gauge military personnel - any ideas. Secondly I note that Noch have produced some N gauge footballers, quite like the idea of a village green match on the layout. No idea whatsoever as to what size the pitch should be. 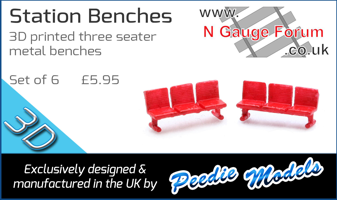 Wonder if any of the N Gauge boffins would have any idea. Military figures - many suitable for mods with a bit of RAF Blue! Arrowhead miniatures, scale 1:144 vehicles and figures, very nice castings. Why am I surrounded by maroons? Be careful with the Pendraken range I have found them to be very poor scale wise and the castings aren't always wonderful. Ask which are the newest designs as these are more likely to scale, buildings and boats are purposely under scale around 1:180-200 so they take up less room on wargame table. I was very disappointed with the vehicles I got from them, most went back for refund, the ones I kept took a lot of work to make them look good. Pendraken claim that their recent models are to 1/150 but I have not checked this my self. Eternal vigilance is the price of liberty." Wendell Phillips. Eternal paranoia is the price of liberty: vigilance is not enough. Len Deighton. That is why I made the point of asking for new items, I was told at a exhibition that buildings etc are not to the same scale. There was a company at Ally Pally offering this service! I am in the process of completing a couple of AEC Matador kits. 4 x 4 Lorry and a 6 wheel Tanker. There may also be some other variations of these at a later date. Page created in 0.108 seconds with 41 queries.